Hyperthyroidism, or overactive thyroid, occurs when the thyroid gland makes more than the needed amounts of thyroid hormones thyroxine and triiodothyronine. Too much of the hormones can lead to fatigue, goiter, heat intolerance, sweating, increased appetite, restlessness and weight loss. Factors that increase the risk of hyperthyroidism include too much iodine, thyroid tumors, inflammation of the thyroid gland and Graves' disease. Treatment commonly involves anti-thyroid medications, although surgery may be recommended in severe cases. Avoiding certain foods, including soy, may be helpful to people with hyperthyroidism. Soy is a plant that belongs to the pea family and has been a part of Asian diet for centuries. It can also be used to prevent or treat a variety of health conditions including high cholesterol, menopausal symptoms, high blood pressure and certain types of cancers, as per University of Maryland Medical Center. 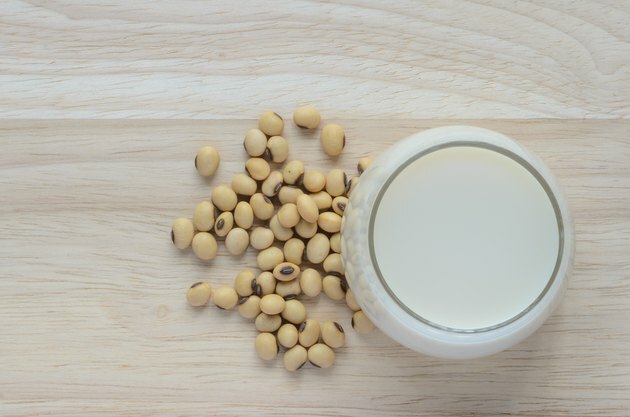 Apart from foods such as tofu and soy milk, soy is also available as tablets and capsules. Soy products are a rich source of proteins and isoflavones. The dose and form may vary. Talk to your doctor to determine whether one is right for you. Soy and soy products are associated with certain side effects as well. Consumption of 1 ounce of soybeans over three months can lead to the enlargement of the thyroid gland and suppress thyroid function. In fact, one of the thyroid isoflavones, genistein, is more effective than some hyperthyroidism medications in inhibiting thyroid function, according to Michael Barbee, author of the book "Politically Incorrect Nutrition." The University of Maryland Medical Center says soy isoflavones can lead to underfunctioning of thyroid hormone. Some animal studies, such as the one published in the October 2009 issue of the journal "Food Research International," also point out that moderate concentration of soy sterols may help lower the intensity of hyperthyroidism, although high doses of soy may have the opposite effect. Soy products may lead to gastric disturbances such as nausea, bloating and constipation. They can also lead to allergic reactions characterized by shortness of breath and skin rash. They may also increase the risk of breast cancer and kidney disease, according to UMMC, and could interfere with certain breast cancer medications and osteoporosis medications. The benefit of soy in hyperthyroidism is not clear. Talk to your doctor before consuming soy, especially if you have thyroid problems. Tell your doctor about pre-existing conditions and any other medications you might be taking.